Start Here & Build with Me! So if a single chick with 3 young kids who also owns and runs a business can build a small cabin YOU CAN TOO! Excuses are for the fishes and if you want a cabin THEN BUILD A CABIN! Sure, it's going to take a while and you're going to have to actually do a lot of work, but it's fun and then at the end of it all YOU GET A CABIN! Man, wouldn't that have been something back in the day of the Oprah show if she went around saying "AND YOU GET A CABIN! AND YOU GET A CABIN! AND YOU GET A CABIN! EVERYONE GETS A CABIN!!!" I totally would've taken a cabin over a car. Speaking of which, you can build a cabin for the same price as a small car. So if you also would like a cabin over a small car, then by-golly BUILD A CABIN! You'll be so happy you did and just know if I can do it, so can you! 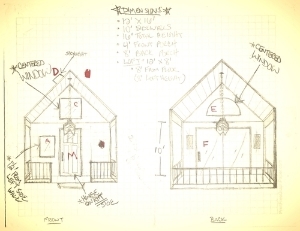 Download the original sketch drawings of the cabin for FREE! See firsthand how easy and simple it is to get started and just say YES to starting such a journey. Click below and the sketches are yours! Click HERE to download my Cabin Chick Cabin Drawings. I hope you enjoy and find them helpful : ) Please note: These are my own personal drawings and not professional architectural drawings. These were enough to give to the shell builders and they took it from there! Would you want STEP-BY-STEP building plans? Well, your wish is my command! Purchase my Tiny Cabin Plans for only $45 so you can build a tiny cabin just like mine and NOT on a trailer! Easily take the provided supply list to any home improvement store and purchase most of your building supplies all at once! If I can build a cabin, so can you! Download my Tiny Cabin Plans so you can get started on our building YOUR cabin and ask me questions along the way. Together, let's build some tiny houses and cabins!